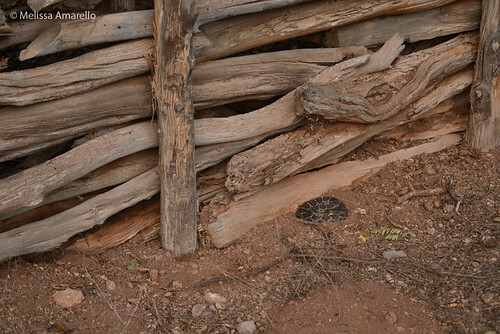 Friday evening while tracking Jaydin, we came across an Arizona black rattlesnake (Crotalus cerberus) hunting along an old corral fence. BeeGee, male Arizona black rattlesnake, 17 August 2012 at 630pm. BeeGee was still there the following morning, so we decided to put a camera on him. While we have captured interactions between rattlesnake species and with squirrels before, it was pretty exciting to see both in one day! 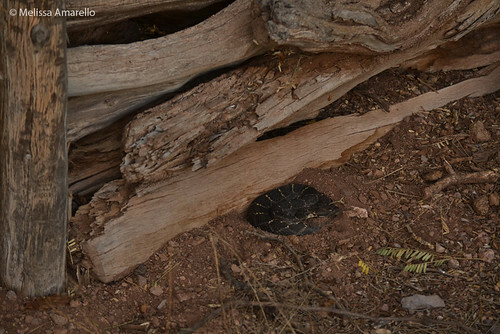 What was going on between the Arizona black and western diamond-backed rattlesnakes? We don’t know and would love to hear your thoughts in the comments below. For more information on squirrel – rattlesnake interactions, check out the work done by Rulon Clark’s lab and his student Bree’s blog. BeeGee, male Arizona black rattlesnake, 18 August 2012 at 9am.